Imagine you are in a big garden, one with flowers of all beautiful bright colors imaginable, with bright blue skies and clear blue waters flowing smoothly like silk; the sun is shining a gentle warmth you’ve never felt before, and the grass is the perfect shade of green. Imagine being carefree, no responsibilities of the world to worry about, just as you were as a child. Imagine having all this and remember God’s promise to us: that He will give us “what no eye has seen nor ear heard”: a true Paradise indeed, one so good that we cannot even imagine it. Such is the promise that we are hoping and waiting for. Author: H. H. Pope Shenouda III. Many write for adults and few are those who write for children. those who love to talk to children. Jonah - "The Lord, his God"
"Where can I flee from Your presence? If I ascend into Heaven, You are there; if I take the wings of the morning, and dwell in the uttermost parts of the sea, even there Your hand shall lead me, and Your right hand shall hold me" (Psalm 139:7-10). 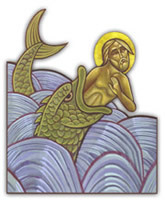 Jonah, according to Hebrew tradition, was the son of the widow, whom Elijah, the prophet, raised from the dead at Zarephath of Sidon (II Kings 17:10-24). He was a prophet in the Northern Kingdom of Israel around 825-784 BC. Therefore, Jonah prophesied during the reign of Jeroboam II, the King of Samaria (II Kings 14:25). The Holy Book of Jonah in the Old Testament tells the familiar story of Jonah, the fleeing prophet. Forty-eight verses comprise the entire story. This is a story of a legendary character with a nature similar to our own. Jonah, a contemporary of the prophet Amos, had faults, shortcomings, and weaknesses.